Dr. Abe has been a pioneer in using computer guided implant placement utilizing precision surgical drill guides based on 3-D CT scans. Most implants today are placed by hand with the surgeon trying to line up the implant visually. The gums are opened up (a gum flap) so the surgeon can see the bone and the shape of the bone. 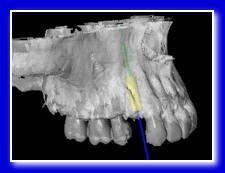 The surgeon then drills into the bone estimating the angle and location so he does not run into any vital structures. The implant is then placed in the bone at the estimated depth and angle. The gum is then replaced and sutured closed. The implant is allowed to heal for 4-6 mos. In a second surgery the gum is opened to "expose" the implant and an abutment is placed ( a post that sticks out of the gum so a crown can be placed on the implant). The gum is allowed to heal for 2-4 weeks. This is important because the gum may "remodel" or change shape as it heals. If a crown is placed and the gum remodels, so the margin is showing, a dark line may remain exposed compromising aesthetics. The patient is then sent to his or her general dentist who then makes the crown on the abutment. Computer guided implant placement has the advantage of being able to simulate the implant surgery utilizing a combination of 3-D imaging from CT scans and computer software to perform or model a virtual surgery before the patient comes in for treatment. Dr. Abe uses CT scans because they are the most accurate 3-D modeling image system available today. A precision surgical guide is made which guides the surgical drills to the ideal position and angulation for implant placement from a restorative view (the ideal placement to make a crown or bridge). The precision surgical guide is worn when the CT scan is made. 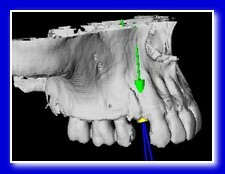 This allows Dr. Abe to see what the ideal position and angle is for implant placement from your dentist's perspective. The implant data from the CT scan is then reformatted into a 3-D model on the computer. The 3-D model can be rotated and manipulated to evaluate the bone in the area which supports implant placement. He also can manipulate the 3-D image to see vital structures within the bone and makes measurements and adjustments to insure he will avoid them at surgery. Once the ideal position, angle, and depth of the implant is modeled on the computer, a precision milling machine is used to make any adjustments required to the precision surgical drilling guide. At the time of implant placement, the surgical drilling guide is placed in the mouth and used to accurately guide drilling and implant placement. This assures that the implant is accurately placed clinically where is was planned virtually on the computer. Since there is no guessing on position, angle or depth, Dr. Abe does not have to peel the gum back to "see the bone" so no gum flaps are opened and no sutures needed. Implants are placed "Flaplesly" to make implant placement as painless as possible. There is less trauma and therefore less discomfort. The abutment can be placed after the implant has healed into the bone (2-4 mos.) Dr. Abe generally uses one surgery implants so a second surgery to open the gums to "expose the implant" is not needed. There is no need to wait for healing after the second surgery (2-4 wks) since they have been maturing and healing since placement. You can be immediately sent to your general dentist for crown placement. Dr. Abe has been modeling implant placement with the CT scans and transferring the data to precision surgical drill guides on virtually all implants placed since 1993. This was before computer modeling was available. He was making the measurements and adjusting the surgical drill guides by hand. He has probably placed more implants utilizing this technology than anyone in the country. These surgical drill guides assure accurate implant placement in location, angle and depth. These extra procedures insure your implants are placed in the the most accurate, safest and least traumatic way possible. Later on, software became available for implant diagnosis. Dr. Abe has been using computer 3-D modeling to create precision surgical drill guides for accurate implant placement on virtually every implant placed since at least 2004. He is one of the most experienced surgeons using this technology in the nation. This provides you with the maximum in precision and safety. There are many vital structures that are present within the bone and under the gums that cannot be seen in three dimensions with normal or panoramic x-rays. These structures can be damaged if inadvertently hit by an implant. The best way to assure that an implant does not impinge on those structures, is to plan and perform implant placement utilizing 3-D computed modeling and performing virtual implant surgery prior to your visit. It is then important that the planned implant placement is accurately transferred to your mouth with a corresponding precision surgical guide. 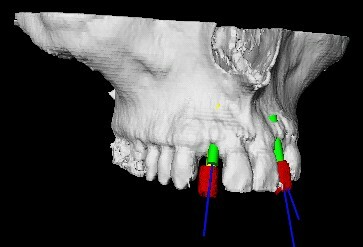 The surgical drill guide is adjusted utilizing the modeling from the computer guided virtual surgery to accurately guide implant placement in the mouth. This gives you the advantage of knowing that you enjoy maximum precision and thus maximum safety in implant placement. Some surgeons may use a computer to plan implant placement but still place the implant without a precision drill guide or an inaccurate one. It was once said that "No matter how brilliant the plan, it is useless if not carried out correctly." The precision surgical drill guide assures that the plan is carried out accurately. This assures that your implant is placed in the most ideal position possible in your mouth. There is also an added bonus... The computer designed surgical drill guide assures precise positioning of implant placement in the three dimensions of location, angulation and depth. Because of the confidence and security of knowing the implants can be placed safely and accurately, "flapless implant placement surgery" can be utilized. The gums do not have to be flapped open to place the implant. Only a small 3-5 mm access hole, smaller than a paper punch, is needed . . . no stitches! This results in less trauma, faster healing, and virtually no bleeding or swelling. This allows Dr. Abe to provide you with a more comfortable dental experience. You can plan to return to work or go about normal daily activity the next day. Normally no pain pills are needed. Most patients use an aspirin type anti-inflammatory or nothing at all.